Budding yeast have historically been used to study genetics. Studies involving cdc28 in S. cerevisiae and cdc2 in S. pombe continue to provide useful insights into mitosis. Saccharomyces cerevisiae is a single-celled eukaryotic microorganism belonging to the kingdom of Fungi. Often utilized in various scientific studies, they are considered as one of the most easily identifiable and widely utilized species of yeasts, commonly known as baker's yeast or brewer's yeast. This yeast is generally identified on the skins of different fruits, specifically grapes, and consists of about 6,000 genes. 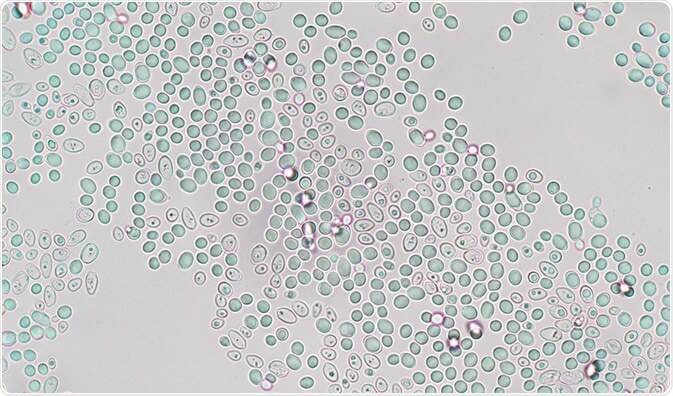 Brewer's yeast is used as an immune enhancer, an energy booster, a protein supplement, or as a vector to carry essential genes that can be inserted into other species to produce commercial health products such as probiotics. The eukaryotic genome S. cerevisiae was sequenced completely for the first time in 1996. At non-permissive temperatures, every S. cerevisiae cell that carries a mutation in a specific cdc gene will arrest a bud of the same size. All types of mutants have a modification in phenotypes with a certain bud size such as no bud, intermediate, or large-sized buds. The phenotypic behavior of cdc28 mutants that are sensitive to temperature signifies the importance of the Cdc28 function in allowing the cell into S phase. Mutants act as wild-type cells when they are shifted to a temperature at which they become nonfunctional (non-permissive temperature), i.e. the largely developed Cdc28 cells that are sufficient to pass START during the temperature shift will continue the cell cycle normally and go through mitosis, whereas the cells that are too small to pass START phase when transitioned to non-permissive temperature will not enter S phase even though nutrients are abundantly available. Even when the cdc28 cells are arrested in G1 phase, at non-permissive temperatures they continue to grow in size but do not initiate bud formation, DNA replication, or synthesize, and thereby cannot enter the S phase. The cdc28 of S. cerevisiae is cell cycle protein kinase that was identified as the first protein kinase. The cdc28 gene of S. cerevisiae is highly homologous with cdc2+ gene of S. pombe. Both the proteins of cdc2 and cdc28 are analogous in terms of their function and cdc2− mutant of S. pombe is complemented to CDC28 of S. cerevisiae. A cyclin-dependent protein kinase in each yeast cell can replace each other between Cdc28 in S. cerevisiae and Cdc2 in S. pombe. It has been identified from different experiments that Cdc28-Cln3 activity is controlled in response to cell size, even though there is no clear understanding of the regulating mechanism. Once the Cdc28-Cln3 has been activated, it phosphorylates and acivates the transcription factors MBF and SBF, which then induce transcription in CLN1 and CLN2 genes and other genes for DNA replication such as genes encoding DNA polymerase, DNA ligase, and enzymes needed for synthesizing deoxyribonucleoside triphosphate. Anaphase-promoting-complex (APC) of yeast is considered as one of the significant substrates for Cdc28-Cln2 and Cdc28-Cln1 complexes. APC is activated by MPF phosphorylation, which in turn directs the polyubiquitination and proteasome degradation of yeast cyclin B, anaphase inhibitor, and spindle apparatus components. The cell gets inactivated at late G1 when APC is phosphorylated by either Cdc28-Cln2 or Cdc28-Cln1. The B type cyclin genes, CLB6 and CLB5, are regulated by MPF and undergo transcription initially in late G1. The transcribed proteins Clb5 and Clb6 get accumulated due to APC inactivation, which would then result in the degradation of these cyclins. During the late S phase in S. cerevisiae, transcription of two additional genes Clb3 and Clb4 also occur, forming heterodimeric kinases along with Cdc28. These complexes combined with Clb5 and Clb6 activate the origin of replication throughout the S phase. Also, the mitotic spindle is formed during the early phase of mitosis, initiated by Cdc28-Clb4 and Cdc28-Clb3 complexes. Furthermore, the two B type cyclins such as Clb1 and Clb2 are expressed when chromosome replication is completed by cells and entered into G2. These proteins perform as mitotic cyclins, and bind with Cdc28 to form complexes that are necessary for nuclear division and chromosome segregation. Thus, each type of cyclin in each cell cycle phase directs the activity of Cdc28 protein kinase into a particular function. For example, in the late G1, transcription of Cdc28-Cln3 is activated by phosphorylation and activation of transcription factors such as MBF and SBF. APC is deactivated by Cdc28-Cln1 and Cdc28-Cln2 that allow B type cyclins to pile up, and stimulates the proteolysis of Sic1, inhibitor of S phase. Cdc28-Clb5, Cdc28-Clb3, Cdc28-Clb4, and Cdc28-Clb6 complexes initiate synthesis of DNA. Mitotic spindle formation is also stimulated by Cdc28-Clb4 and Cdc28-Clb3 and nuclear division is triggered by Cdc28-Clb2 and Cdc28-Clb1. Development of S phase stimulating factors and Sic1 inhibitor degradation in S phase activates DNA replication will be studied further based on genetics of S. cerevisiae.